On mobile chat and messaging programs, nothing’s more frustrating than the ambiguity of not knowing if someone has blocked you on Kik, or if your chat app is simply encountering an error. This is no different for Kik Messenger or the popular application’s millions of users. We all have disagreements or poor choices of words with our acquaintances and friends from time to time, and it’s fairly easy to block a person from contacting you further if the need should ever arise. It’s a fairly safe thing to do, as well. Maybe you’re being contacted by someone you’d rather not speak to; an unfriendly person, or a stranger. Maybe you’re in need of a “cooling off” period after some heated words with friends. Maybe your ex simply will not stop messaging you! 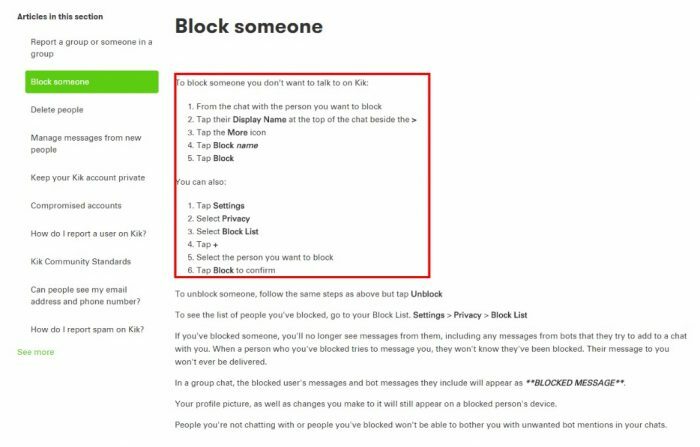 No matter the reason, the “block” feature in Kik Messenger exists for a reason. However, when it’s used on you, it’s understandable that you’ll want to know about it! Unfortunately, as with many chat and messaging programs, there’s no surefire way to know if a person has blocked you or not. There are, however, a few ways to collect evidence for an educated guess, and I’ll share a few tips on how to proceed from this understandably frustrating situation. How Can I Tell if Someone Has Blocked Me? Since there’s no way to know, for sure, if someone has blocked you on Kik Messenger, it’s up to you to look at your messaging history and make as close of a guess as you can. This is frustrating, but there is some very solid reasoning behind not allowing blocked people to realize this has been done to them. Do They Have Reason to Block You? This might require a little more soul-searching than we have the time for in this article, but it’s a question that you should consider before jumping to the conclusion that you’ve been blocked on Kik Messenger. Are you dealing with a friend or a new acquaintance? An old friend is going to be a lot less likely to block you, outside of dire circumstances. A fresh acquaintance, however, might have reason to cease contact with you if anything unpleasant or simply unwanted has occurred in communications. Are Your Messages Being Delivered? Now, there’s some distinction to draw between which letter is next to your message, and what that says about where your message is. If your messages still have an S next to them, then there’s good news and bad news. The good news is that the recipient has very likely not blocked you, and is instead simply not receiving your messages. The bad news is just that: they’re still not getting your messages- This can happen for a few reasons, and they’re all unfortunately out of your hands. On the rare occasion, a message or two can get hung up in the chat servers responsible for delivering your messages. This is a very rare occurrence, but it’s capable of happening on any digital chat platform. Your best bet? Try sending your message again, to see if it gets through. It might also be the case that your intended recipient simply doesn’t have an active connection to the internet, or has their device turned off. In both of these cases, Kik Messenger won’t be able to deliver your message. What if you have a D next to your message, though? Here’s an interesting fact: even if you’ve been blocked, all of your messages will still be received by the Kik servers. This is frustrating, but before you jump to conclusions, realize that it can also be informative! Some users believe that a faded D, rather than a solid letter, is an indicator that you’ve been blocked, but this is not the case, either. As is explained in our more extensive read-notification guide, a faded D simply means that your message hasn’t been seen in the recipient’s Kik messenger program. It has nothing to do with whether you’ve been blocked or not. Rather than assume you’ve been blocked–a fact which you cannot determine–instead assume that there’s no need for you to send any further messages. Even though your message may have a D, next to it, the fact that you’ve been blocked will mean that the other person cannot see your messages. However, if the read-notification next to your message should ever turn into an R, you can rest assured that you most certainly are not blocked! Due to the user-blocking system in Kik Messenger, a message that has been read is a surefire sign that your recipient is both receiving and reading your messages. We should all remember, though, that just because a message has an R next to it, this still doesn’t mean we’re guaranteed to receive a speedy response. In short? Carry on with your own activity, and stop spending your energy investigating a situation that will never give you a certain resolution. Many workarounds, tips, and tricks exist to help navigate Kik Messenger’s various features and capabilities, but none of them will help you to determine whether you’ve been blocked by an individual or not. Thankfully, Kik is a great platform for messaging that also packs features that can help you to move past the frustration of being blocked. Miss chatting about a particular topic? Give that topic a search in Kik’s integrated web browser, and find someone else wanting to discuss the same thing. Kik has millions of users, which means that finding others to chat and engage with doesn’t have to be a difficulty. Get your mind off the frustration of potentially being blocked and invest that energy into some positive bridge-building! Through some pro-active effort on your part, you can move past the worry from this sort of situation and keep on with your usual Kik activity! After all, if there’s no way to find a resolution to the question that’s nagging at you, it’s best to move on and enjoy yourself elsewhere, right? Why Can’t I Know If Someone Has Blocked Me? This is a more common question than you might think, and answering it requires a little bit of objective thought. Try putting yourself in the shoes of the person doing the blocking, and the reasoning might seem slightly clearer. Very few messaging applications allow you to know if you’ve been blocked, and more so, you won’t be informed why you’ve been blocked. Should you assume that each of these reasons automatically applies to you? Of course not! Like I said above, there’s no way to determine exactly why you might have been blocked. Therefore, it’s a somewhat futile effort to investigate the situation for very long. Instead, imagine yourself in a situation where another person is sending you messages that you don’t want. It could be for any reason, but isn’t there a great sense of safety and satisfaction in knowing that you don’t have to see these messages? In almost every scenario, keeping users happy has to be Kik Messenger’s greatest priority, even if it means leaving people who have been blocked in the dark. However, the tips and tricks above can certainly help you to narrow down whether you’ve been blocked or not, even if Kik doesn’t give you a way to know it for sure. I should point out that just because only certain letters pop up, doesn’t mean that it’s exactly true. For example, I run a modified version of Kik, and it’s set so that if anyone sends me a message, it will be permanently stuck on S, unless I decide to change it. For example, I could even open their message, and it would still say that I never even got it in the first place.